Walkways must be kept dry and clean. If you have an accident at work due to your employer failing to keep the paths and walkways around your place of work, whether it be an office, factory or shop, free from hazards then you can look to bring a claim for compensation for your injuries and losses. Cohen Cramer Solicitors can help you claim the compensation that you deserve. The hazard can be a piece of packing or plant left on the floor or other general work or office debris such as a pile of files. 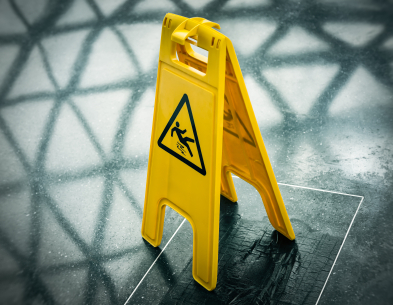 It may be spilled cutting oil or machine lubricant that has leaked from a machine that no-one has bothered to clean up – whatever it is, it should not be there and you are entitled to make a claim for your injuries and losses. Your employer has a legal obligation to keep all walkways and paths clear and free from all hazards. If they don’t and you sustain injury you can claim from your employer’s insurers. You can claim for your injuries; this includes not only your physical injuries but also any scarring or mental issues that are a result of the accident. You can also claim for your financial losses such as lost income (past and future), care and treatment costs as well as other financial losses arising from the accident. Your claim can be dealt with on a No-Win No Fee basis; this means that if for any reason your claim fails you will not be charged for the work we have done on your behalf.